So, you may have noticed from yesterday’s WiB that I didn’t finish that many books last week. 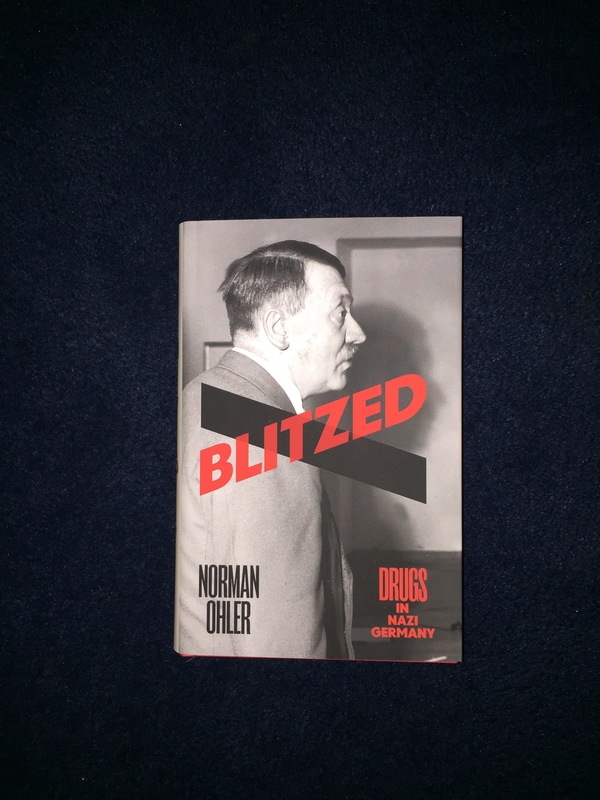 But that was not a problem when it came to picking a BotW, because one of the books that I did finish was Norman Ohler’s Blitzed. It’s only in hardback at the moment I’m afraid, but I’m just happy it’s been translated at all. Ohler’s thesis is that large amounts of drugs were consumed by Nazi troops as they steamrollered through Europe, that drugs were equally consumed by people on the homair front and that during the latter stages of the war (from around 1941 onwards) Hitler himself was dependent on hard drugs. Ohler backs up his assertions with primary source research using documents held in archives in Germany and in America and makes a persuasive case. Now before I go any further, I need to say that although I have a history degree, I have, in the main, avoided study of Nazi Germany because I find it too unbearably terrible. Luckily my school stopped studying WW2 Germany at A-Level the year before I started sixth form* and at university I managed to avoid Twentieth Century history for all but one term** so I am no expert. I found Ohler’s book incredibly readable and very well researched. It’s an appealing idea. The Nazis were off their heads on drugs. That’s why they did it. It’s comforting and reassuring – it was the drugs which made them do it – and means that you don’t have to worry about what you would have done in their place. I don’t think this is what Ohler is trying to say. In the case of Hitler he’s very specific that it doesn’t explain all of Hitler’s actions – just enabled him to maintain and continue his rule. As for the man on the street, or the soldier in a panzer regiment, the drugs enabled them to keep going for longer than otherwise. So I suppose what I’m saying is that this book shouldn’t be seen in isolation or viewed as the whole story. That would be far too simplistic. But it has new ideas and research I haven’t heard about before and is worth reading, if only so that you know what the historians are arguing about. Because they are going to argue about this. Get your copy of Blitzed from Amazon, Waterstones or Foyles or on Kindle or Kobo. The paperback is out in May – pre-order on Amazon. Or if you don’t want to read the whole thing, Dan Snow interviewed Norman Ohler on his History Hit Podcast and it was reviewed in the December issue of Literary Review (subscription needed). *We did Tudor England, the French Revolution, France 1814-1914 and the Italian Risorgimento which was much more to my taste. ** the second term of my first year, where my seminar tutor was a German Post Grad whose thesis was on “images of death in 20th Century Germany”.